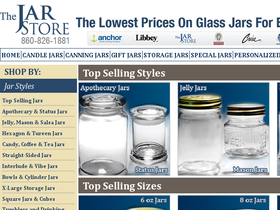 Visit The Jar Store online at JarStore.com where you will find glass jars in numerous sizes and shapes. In addition the JarStore.com also offers scents, waxes, and essentials of several different varieties. Visit 58Coupons.com to learn about the latest The Jar Store savings, The Jar Store discounts, The Jar Store coupons and The Jar Store promotions available when shopping at JarStore.com. Buy All Natural Soy Wax from The Jar Store where you can get a 50lb box for only $59.50. Click link to learn more. Get 12 one ounce bottles for only $19.95 from The Jar Store and sample their fragrances today with their premium fragrance kit. Click link to get picking! At The Jar Store you can get cool apothecary jars starting at only 79 cents each. Click link for the Apothecary selection. Get a bulk discount from The Jar Store today when you purchase 500 jars of any combination. Click link to learn more.